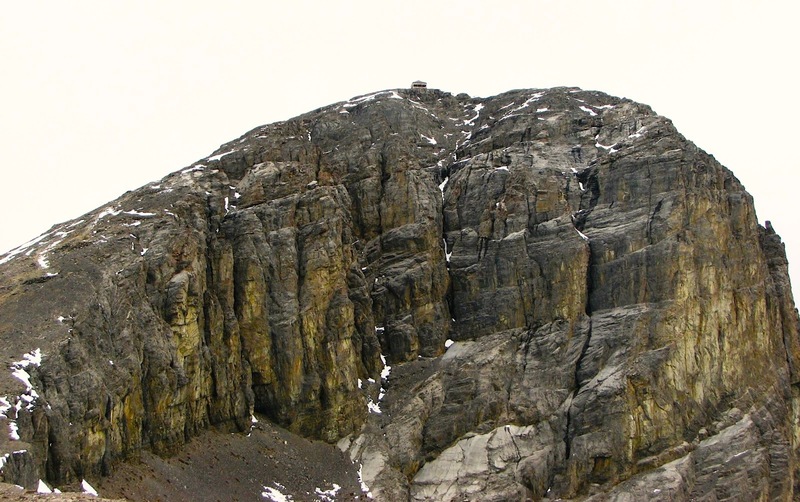 Black Rock Mountain, a prominent peak in the front range of the Canadian Rockies, features a small piece of Alberta’s history perched on its summit. The Black Rock Fire Lookout, one of dozens of decommissioned and forgotten lookouts spread across the province, was built in 1928 and operated for twenty-two years until its closure in 1950. 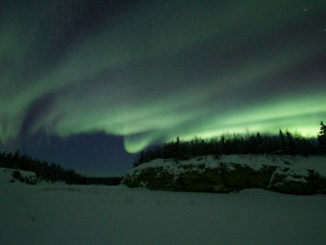 Black Rock Mountain, so named for its black appearance especially when viewed from the east, was chosen by the Canadian Forest Service for its unique geographical characteristics. Black Rock is a solitary mountain, standing alone slightly east of its neighbouring peaks. There are no other mountains directly to the north or the south, giving the summit unparalleled views of the forest-covered foothills beyond. Harry Fisher of the Canadian Forest Service, a sector of the federal government’s Department of the Interior, was the man tasked with surveying and constructing the lookout on Black Rock’s summit. The small twelve-square-foot cabin was built from wood and rested on four cement blocks, meaning the floor was always cold as the cabin wasn’t equipped with a proper foundation. 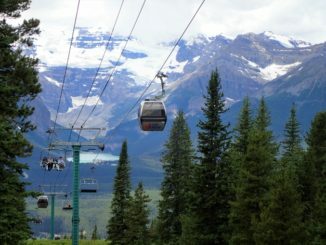 To combat the intense wind that battered the summit, the entire cabin was tethered to the mountain using steel cables. Unfortunately, due to the same winds, the latrine had to be built out of stone to prevent it from blowing directly off the mountain. The primitive facilities included a small wind-break and a narrow bench-like seat. Meals were prepared on a single-burner white gas stove and heat was provided by a small gasoline stove, which was quite insufficient considering the cabin’s draftiness. The lookout wasn’t equipped with a standard radio for communication, instead the cabin was connected to the Aura Ranger Station via telephone lines. 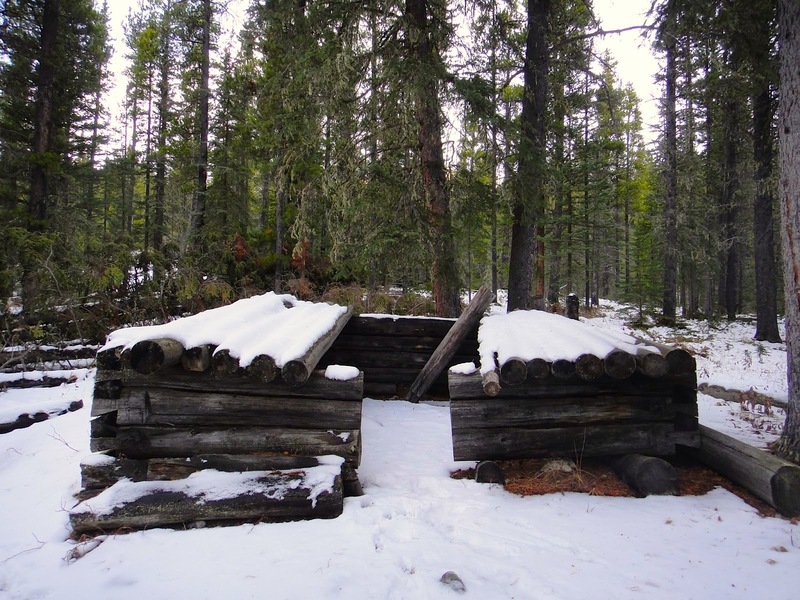 All of the materials needed to build the cabin and to resupply the lookout’s employee were carried by pack-horse; no easy task when you consider the mountain’s remoteness. 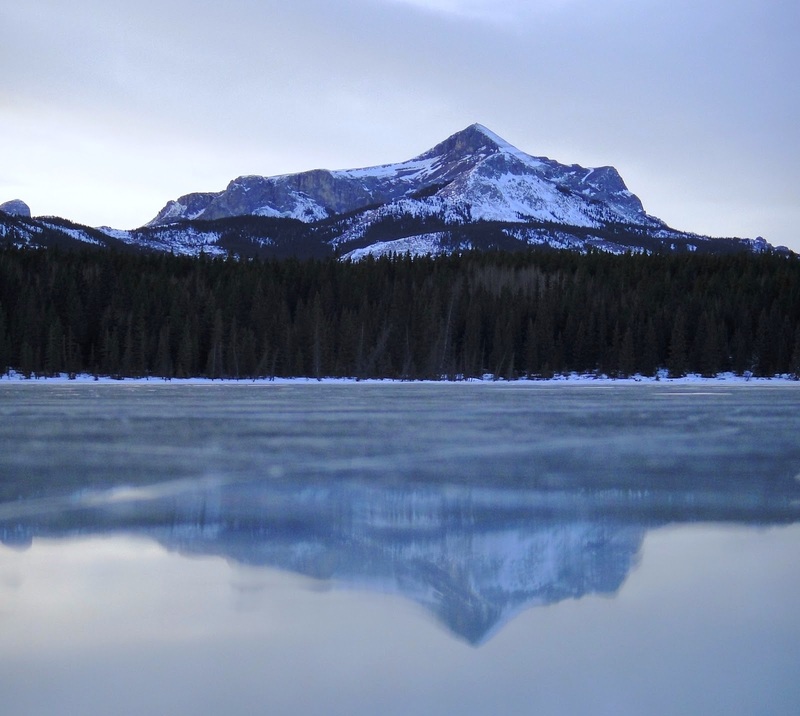 The nearest facility at that time was the Aura Ranger Station (later the Ghost Ranger Station and now the site of the Rocky Mountain National Army Cadet Summer Training Centre); a distance of 16.5km as the crow flies. Resupply trips needed a minimum of three days; a day’s ride to the overnight cabin at the base of the mountain, the second day was spent delivering supplies to the summit, and a final day was needed to return to the Ranger Station. Instead of guiding the pack-horses directly to the summit they were tied to a hitching post in a meadow and the supplies were then carried in backpacks the final few hundred yards to the top. 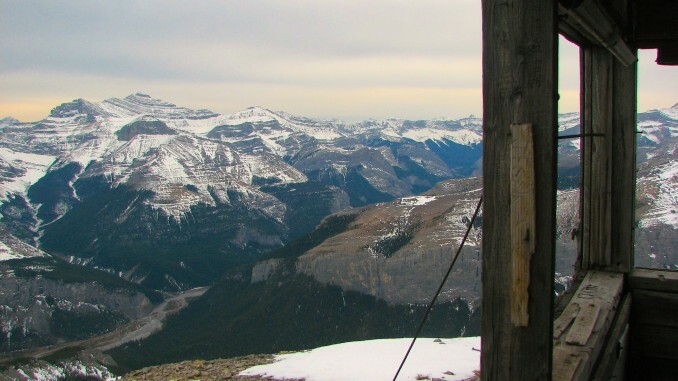 The Black Rock Fire Lookout was the second highest (2,462m or 8,078ft) along the eastern slope of the Rockies as surveyed by the Canadian Forest Service. 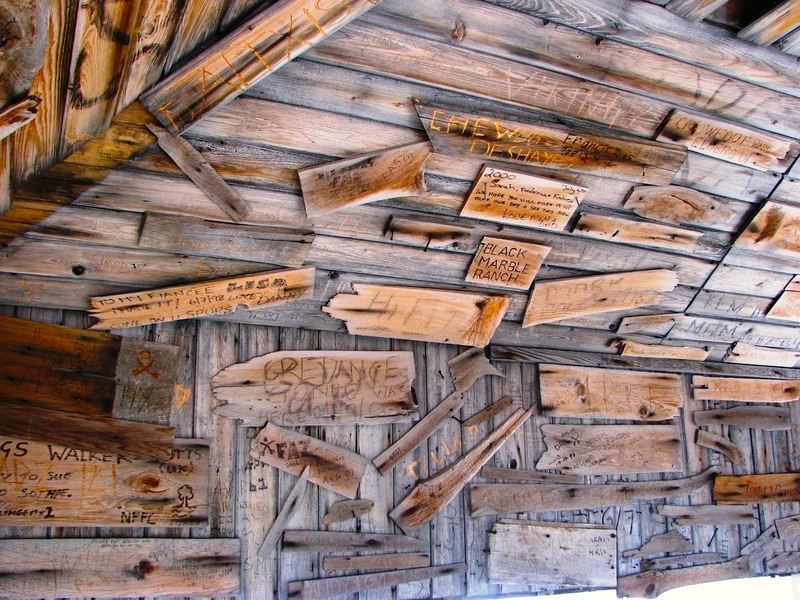 Eventually the lookout was abandoned in favor of a new location; the Mockingbird Fire Lookout. Mockingbird is lower than Black Rock, has easier access, and its summit isn’t prone to be shrouded in clouds, which made smoke detection all but impossible from its predecessor. 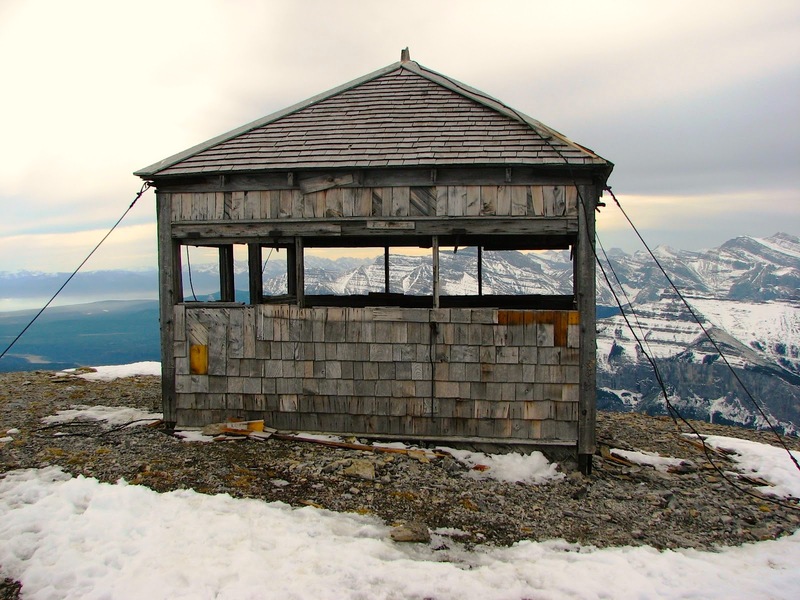 Today the Black Rock Fire Lookout remains on the wind-beaten summit, much as it has since 1950. There is nothing inside, save for countless signatures carved into its wooden interior. 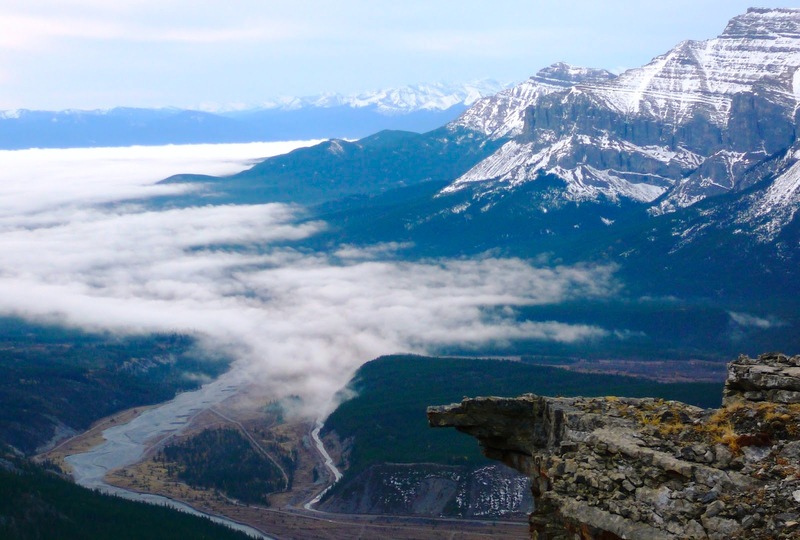 It’s accessible for those willing to attempt a difficult hike in remote wilderness; after all reaching this lookout is not the easiest thing to do! 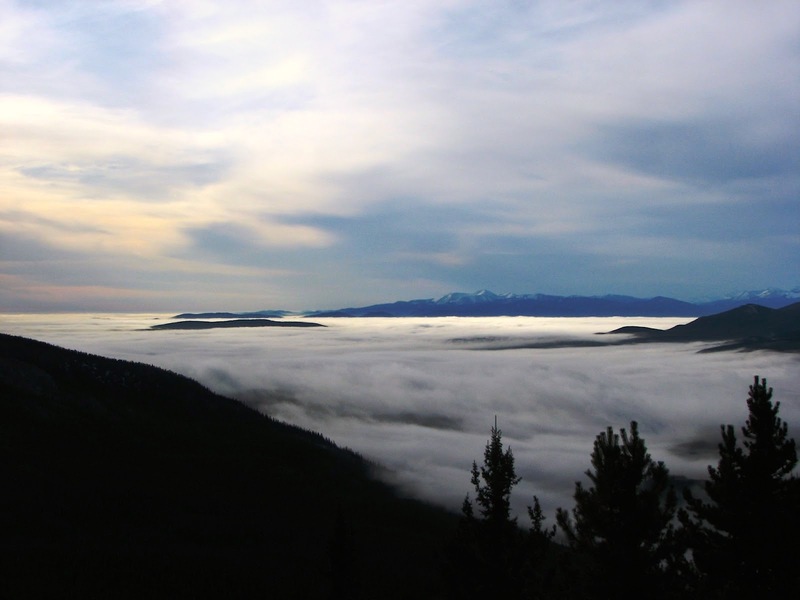 Black Rock is located in Don Getty Wildland Provincial Park, which is sandwiched between the Ghost Public Land Use Zone (PLUZ) to the north and the east, the Ghost River Wilderness Area to the west, and Banff National Park to the south. The trail from the backcountry campground is approximately 18km round-trip with 900m gained in elevation; provided you can find it. The most straightforward way is via the extremely rough TransAlta Road (I highly recommend a vehicle with 4×4 capabilities), which is off of the Forestry Trunk Road. There is random parking at the end of the road as you enter the Ghost Valley. 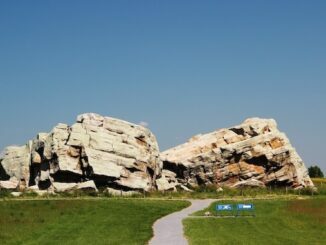 From there you can begin hiking north along the rocky riverbed towards the campground and trailhead. While standing inside the dilapidated remains it’s hard to imagine anyone living up here, alone and exposed, for months at a time. I gained new respect for the men and women that are still employed as lookouts during Alberta’s wildfire season; luckily their accommodations are slightly more modern! As mentioned in my previous story on Wildland Firefighters, the lookout observers are the first line of defense against forest fires. They spot the smoke early and radio its location so firefighter teams can put it out while the fire is still manageable. 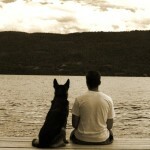 Remember wildfire season starts on March 1st in Alberta. For additional information please visit the Alberta Wildfire website or you can follow them on Facebook, Twitter, and Instagram. You can also download the Alberta Wildfire smartphone app, which is now available on both iOS and Android.